​Rev. Barry King has had an connection to Spirit since birth. He remembers visits to the Spirit world as a very young child and visits by his grandmother’s spirit the night of her death and his grandfather the day he died unexpectedly from a heart attack. Initially he thought that this was normal and shared it freely but it did not take long for him to realize that it was better to not mention these experiences with the unseen world. As he grew older, his gift became stronger until he could no longer ignore it and he began learning how to control it and be comfortable with it. Today he has worked to develop and share his intuitive gifts for over 40 years. In that time, he has dedicated himself to sharing the certain knowledge that there is no death and that we are Spirit. 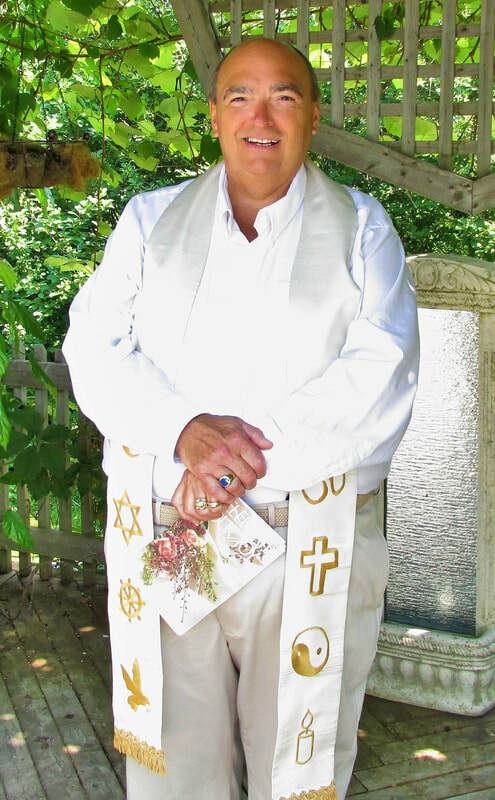 Barry has an active practice for readings and consultations and is well-known as a proof of survival medium. Rev. Barry King, PhD is co-founder and Educational Director of the iNtuitive Times Institute, and is co-founder, President and Senior Minister of the PEI (Prince Edward Island) Interfaith Ministry and OIIM (Open International Interfaith Ministry). He has a B.Sc. (Honours) from Dalhousie University, is an Ordained Minister through the Spiritual Science Fellowship and has a Doctorate in Therapeutic Counselling awarded through the SSF Seminary, the IIIHS, in Montreal and is also a registered clergy member through the ICCC (International Council of Community Churches) and the WAIC (World Alliance of Interfaith Clergy). Through the PEI Interfaith Ministry, he encourages people to embrace the knowledge that intuitive abilities are gifts of Spirit and as such are everyone’s birth right. He believes that our connection to Spirit and the Spirit realms is a natural birthright for each of us as we are all by nature – Spirit. ​Rev Barry King, Master Spiritual Medium shares a bit about the nature of being Spirit and what one can expect from a reading with him. A reading is not fortune telling but does allow Spirit to provide you with guidance and empowerment as you move along your journey. There are things that you can expect but they are things that you are creating today through the power of choice. Rev Barry talks about being psychic and developing ones gifts. He also discusses the fact that we all have the capacity to connect to Spirit since we are by nature Eternal Infinite Spirit living a life immersed in a physical existence. Join Rev Barry King as he explores the nature of being spirit and experiencing the limitations of a physical existence. Also, celebrates the power of choice in our lives to shape and mold ourselves and our future. Living Consciously is the way to be present in your life and how we can take responsibility for our joy and our challenges. Living is about being conscious and growing.